How does the Classics department claim to convey global knowledge? The department claims to convey global knowledge in two ways: encouraging students to travel to experience other cultures first hand and indirectly imparting global knowledge to students in the course of their studies, assuming that knowledge of the ancient world can be applied to the modern world as global knowledge. Ancient History and Classics: Outdated Subjects for a Modern World? There are also pictures such as the one below showing students participating in study tours. The joint degree course in Italian and Classics is a good example of incorporating global knowledge into the study of classics as it includes a year abroad. Some of the same observations made in the section on community engagement apply here as well in relation to the department's use of travel opportunities to entice prospective students. Another interesting and perhaps unconventional use of media on the website was the link given to the podcast of an interview by a current student of one of the department's professors. However it is quite revealing in terms of providing some of the undiluted views of a Classics undergraduate student and similarly so for a lecturer, seeing some of his views on the subject and its relevance to the modern world. I found it very interesting that the student had the perception of the department being "often overlooked" as the University placed greater emphasis on sciences, some students, by her account, not even knowing that it exists. In the later part of the interview, the professor explores the links between past and future events and how knowledge of the ancient world can inform our view of the world today. This theme is repeated in other parts of the website, for example the module description given above. There is little in the way of use of the actual term "global knowledge," in this case I think it is mostly considered implicit in the course. 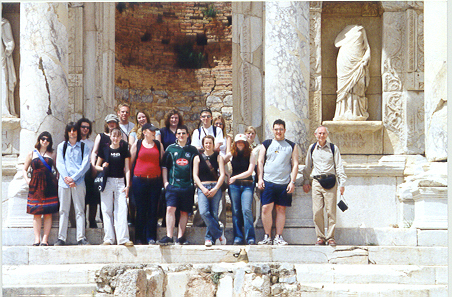 There is a considerable element of global knowledge claimed in the degree courses offered by the Classics department, but it must be noted that this is mainly related directly to the course and so it is seems to be largely related to Europe and the Mediterranean, both in terms of what is studied in the course and in terms of the trips available. Also the study tours and summer schools are not a part of the actual course, rather they are “encouraged” or “a chance” that students are given. Hence they may require funding from the students involved themselves and therefore not be completely inclusive (further investigation needed).